Beginning in 2014, all California Smog stations will be required to stop using the existing BAR-97 equipment for smog testing and replace it with the new BAR-OIS system for all 2000 and newer vehicles. This new system will perform the test thru the vehicle's OBDII port. The new BAR-OIS system will consist of a DAD, or Data Aqusition Device, such as the IMclean, a Windows PC, printer, and barcode scanner. Smog shops will access the BAR-OIS website via an online portal, (BAR-OIS), to perform BAR approved emission testing. The web-based smog test program will guide the technician thru a series of steps to connect the DAD device to the vehicle's OBDII port. The actual test portion of the new system takes just 2 to 4 minutes, and the entire process including your paperwork and visual inspection should only take you or your technicians 8 to 10 minutes total. To understand the process for installing and using the BAR-OIS system. Click HERE to watch a video on BAR-OIS Software Registration, and purchasing certificates. The new BAR-OIS system is compatible with industry standard Windows based computer systems. 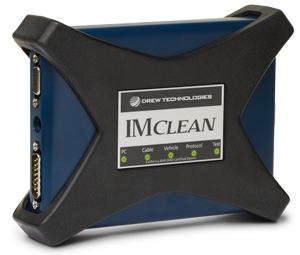 Smog shops can either buy a complete, compatible tested package from a vendor like Drew Technologies with everything needed for fast implementation, or can elect to piece together their own system using a Windows computer, barcode scanner, printer, and BAR-DAD device such as the IMclean. Drew Technologies has validated its products to support a complete package and also for customers that want to put together their own system. You can assemble your own system by purchasing a workstation cart and IMclean DAD from Drew TechnologiesHERE and can source your own computer, monitor, barcode scanner, and printer. Drew Technologies offers technical support on all of it's products. If you have any questions, you can reach us by calling 877.888.2534 (option 3) or emailing us at support@drewtech.com. Drew Technologies, Inc. is a world leader in vehicle communciations tools. We make tooling for both the automotive manufacturers and aftermarket repair shops. What is a DAD device? The DAD is a Data Acquisition Device. It used in conjunction with a PC and the BAR OIS software to perform emissions inspections on vehicles 2000 and newer. What is different from the old (BAR97) system? There is much less equipment now used for emissions test, tailpipe tests are no longer required on vehicles 2000 and newer, no gas cap checks, and the testing program, BAR OIS, is web based. Do the tests take longer? Tests will be faster with the OIS/DAD system, we have seen around 2-3 minutes for the OBD portion.Test speed depends on afew factors. Vehicle age, PC performance, and Internet connection speed. Vehicles MY2008 and newer use a faster communciation protocol than vehicles produced before 2008. Computers with more RAM and faster processors will allow the program to run faster. A faster internet connection will allow the OIS application to communicate faster. Do I need a dedicated internet connection for each OIS station? No, your shop's internet wil work fine, no need for additional service. Can I use my old Windows XP/Vista Laptop? Does each OIS station need a printer? Each OIS station needs constant access to a printer. This can either be a dedicated printer at each station or a printer connected to your shop network, that all PCs can access. How far does the Bluetooth reach? The IMclean Bluetooth has a functional range of 30 feet. Walls/heavy metals/welders/plasma cutters can all cause either shortened range or interference. Who can I contact for support with my IMclean? Our office hours are 9am - 5:30pm EST, Monday - Friday. Call us at 877.888.2534 (option 3) or email us at support@drewtech.com if the matter is not urgent. What vehicles can I test with BAR OIS? 2000 and newer Gas, Diesel & Hybrid vehicles under 14,000 lbs. What are the Basic PC/hardware requirements? Can I use my jump box for External power during a vehicle test? No, jump boxes introduce a differential ground and will stop communication with the vehicle. Can I use an OBD2 extender cable? No, these cables have not been tested or certified for use with the IMclean, and going beyond certain lengths can cause communciation problems on most vehicle. Can I use a USB extender for wired communication? No, USB extenders are neither tested nor certified for use with the IMclean, also going over 5 meters in length can cause data loss. Why wont my barcode scanner scan VINs and registration paperwork properly? Your Barcode scanner may need to have the Code 39 functionality enabled, and Full ASCII is disabled. See you BarCode scanner documentation for directions. Click the link below for documentation on many popular barcode scanners. Barcode scanner documentation. My Wall License will not scan properly, but I can scan VINs and my badge? Try scanning your Wall license into your PC and printing the Barcode portion larger, and the scan the larger Barcode. This has worked in several instances. My IMclean got locked during a failed inspection or self test, How do I unlock it in OIS? Watch this video for directions for doing a DAD self test.